RINGO attended the 25th meeting of ACARE WG1, responsible for the topic Meeting Societal & Market Needs. In order to foster participation within the five Advisory Council for Aviation Research and innovation in Europe(ACARE) Working Groups, RINGO has been presented during the 25th ACARE WG1 meeting held in Madrid on September 19th. The meeting was intended to coordinate the work of the WG1 towards the SRIA update of Volume 2. 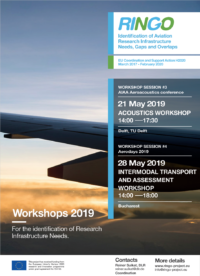 In this framework RINGO provided an overview of the contribution it will generate in terms of identification of needs, gaps and overlaps of aviation research infrastructures. The RINGO presentation has been co-located with presentations of other CSAs supporting ACARE within different topics. Representatives from European Commission, research centers, universities, industry and operations participated in the meeting. They recognized RINGO and its goals, and acknowledged the necessity of RINGO. WG1 members granted their support to RINGO in the future.